I have moved to a new domain! Well, yesterday was. It was a little bit bummer: my car wouldn't start, overwhelming classes and one of my dad's dogs died. It ended up better, AAA and Ashton saved the day. 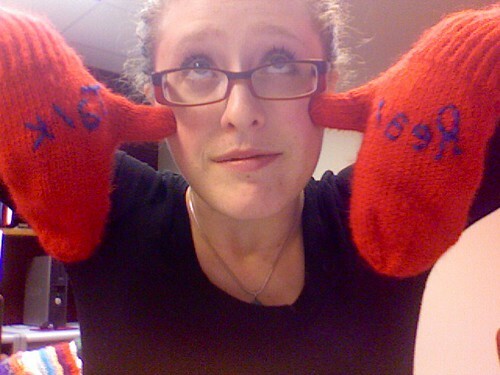 Either way, I finished Annie's REAL TALK mittens. I used size 5s with a worsted weight so they are really really stiff and warm. I used Debbie Stoller's new yarn, Full o' Sheep. So far, I am really impressed with her yarns. I am using Alpaca Love for my Beatnik, so I've tried most of them. Full o' Sheep reminds me a lot of Lamb's Pride worsted weight, but better because it doesn't have that annoying alpaca element that sheds everywhere. The colors are super saturated and awesome. In case you don't know what REAL TALK MEANS (and you probably shouldn't if you are a sane individual) listen to this gem of modern music. 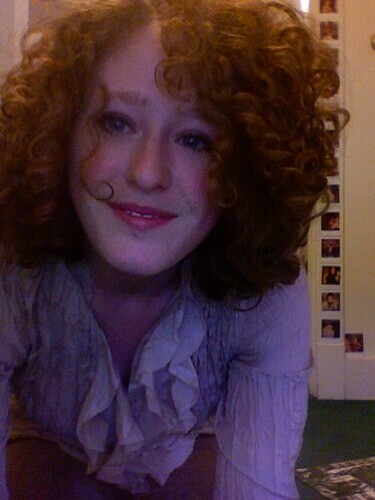 I found this Free People dress at VDO. I love it. 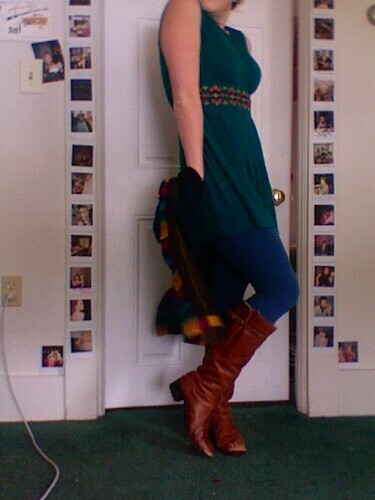 I wore it with my zany and colorful OKM sweater and my new thrifted boots. My friend Adam and I found them at Unique thrift. They are fur lined and so majestic- we declared it BOOT DAY. I start my first PAID writing gig today. Business Casual. Me. HOW WILL I DO THIS? 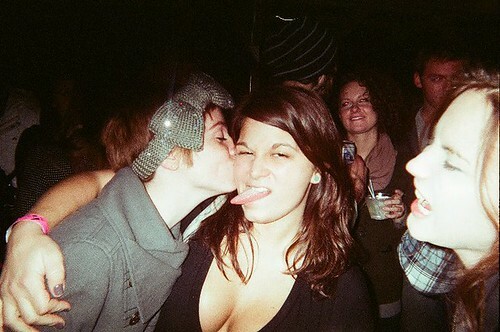 I wear leotards and goofy hot pants- NOT slacks and button downs. 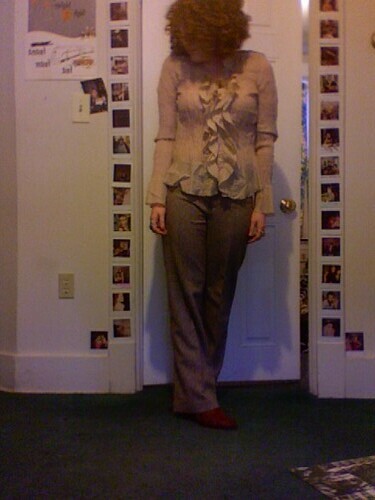 Either way, my mom and I bought these nice wool pants at the VDO along with the silk shirt. I love thrifting with my mom. 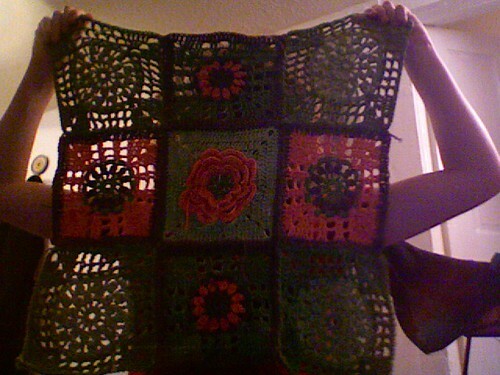 The color looks a bit splotchy because it is still blocking- but it is done! I hope Katelyn likes it. 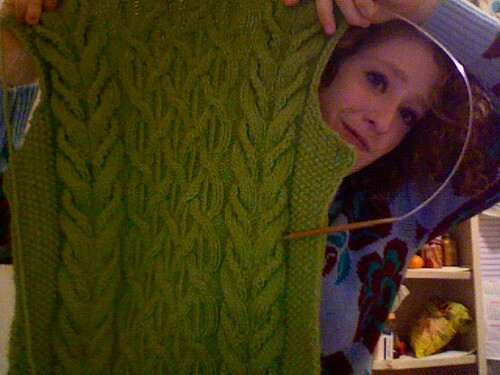 Things I am good at: stealing pictures of my knitting from other people's facebooks. I am ALMOST finished with the front of my Beatnik sweater. My favorite cousin, Katelyn, is pregnant with twins. I am making her a BUNCH of stuff because that's what I do. I think I am going to make her distinctly different things for each baby because I'm sure she will be sick of two of everything. 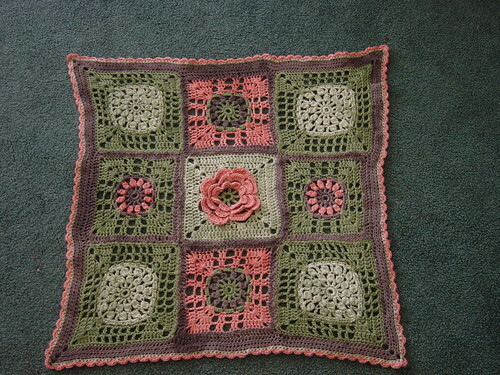 I am using the 200 Crochet Block book and Caron's Country, a wool blend. I have never used it before but I must say, I LOVE the muted color palate and how the fabric drapes. More and higher quality pictures when I finished later on tonight. A compulsive knitter, trying to live one row at a time.